We slept hard last night. Both of us were spent from yesterday’s hike and needed the rest. We knew we had another short day so we let ourselves sleep in until 6:30 am. We didn’t want to wait too long knowing we would have a lot of snow walking in our future and afternoon sun equals posthole hell. We were walking just before 8 am. We had camped amongst trees on a large plateau. It was beautiful and there was not a soul around. We walked down about a mile to Wallace Creek. The trail was mostly covered by icy snow which made Andy uncomfortable. Laurie loves walking on snow and enjoyed slipping about. We walked slowly and carefully so as not to injure ourselves. Both of Andy’s knees have been sore with steep downhills, particularly on snow, so he was particularly cautious with his steps. At the end of one snowy section Andy stopped to eat a bar. He had discovered that eating while walking on slippery snow was too difficult and was greatly looking forward to a treat. As he tore the wrapper the bar slipped right out and onto the ground. Andy stomped, threw down his poles and had a little temper tantrum in the middle of the trail making Laurie laugh. It didn’t last long and soon he was smiling again too. Wallace Creek was our first ford of the Sierras. 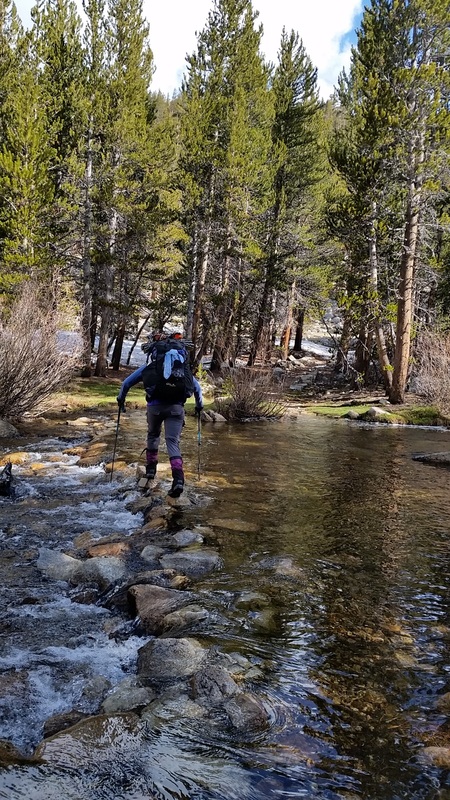 There is much talk of when is the best time to enter the Sierras… Too early and you have a lot of snow, too late and the creeks are running high from snow melt and can be dangerous. We like to believe our timing is just right – a little challenge on both ends but nothing too dangerous. Laurie rock hopped across Wallace Creek like a pro and Andy took off his shoes and waded across in Crocs. The water was COLD but Andy was a trooper. We walked another 0.7 miles to Wright Creek where we both waded across. The water was only knee deep and cold but bearable. 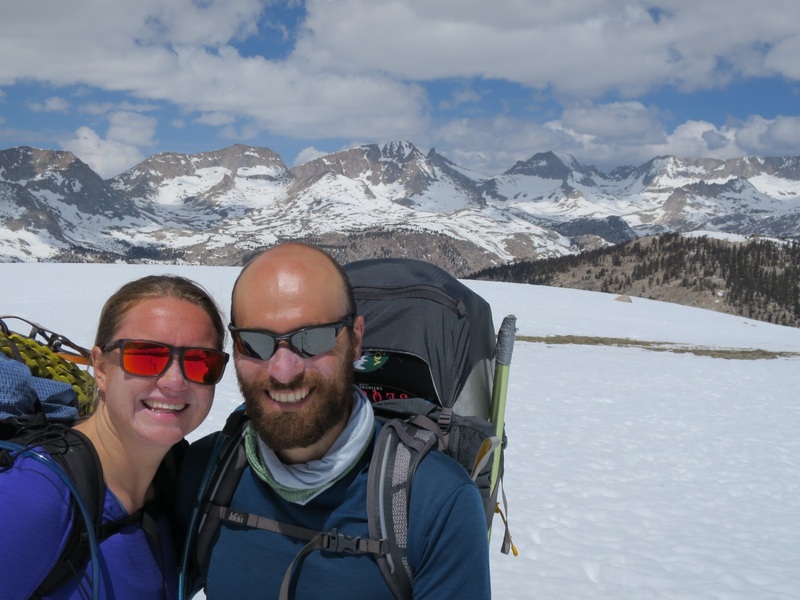 The trail then climbed up 699ft to one of Andy’s favorite places in the Sierras – the Bighorn Platueau. We could see Forester Pass in the distance amongst many dark clouds. We walked on snow for about half a mile, rarely post holing and taking in the expansive views. 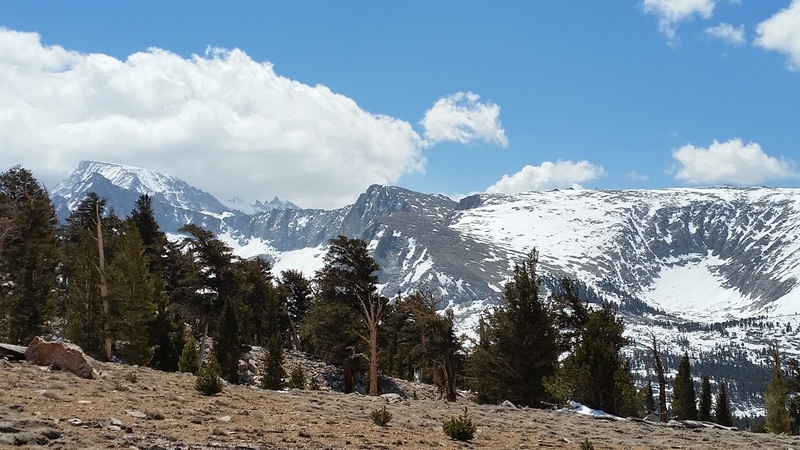 270 degree views of snow capped mountains… It was idealic! We continued on and dropped down to Tyndall Creek. 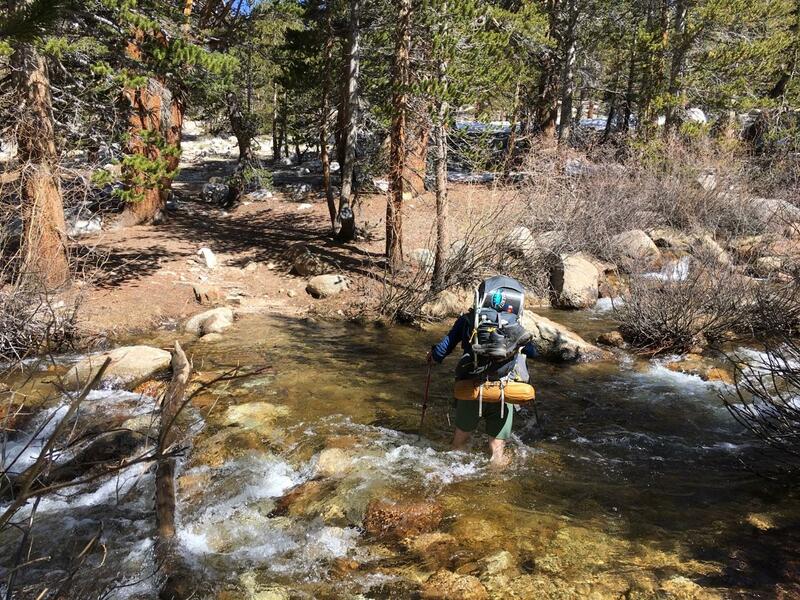 Laurie camped here on her 2012 JMT hike but could hardly recognize the area now covered in snow with a rushing creek. Some of the rocks were covered in at least 2 inches of water. We both rock walked across, praising the waterproof nature of our hiking boots and gaiters. We walked a little ways up the trail and stopped for lunch. We aired out our socks and boots, unclear if the dampness inside Laurie’s boots was due to sweat or creek water. While eating, the clouds above us darkened. It started to snow very lightly as we packed up our bags. We continued on uphill towards Forester Pass. 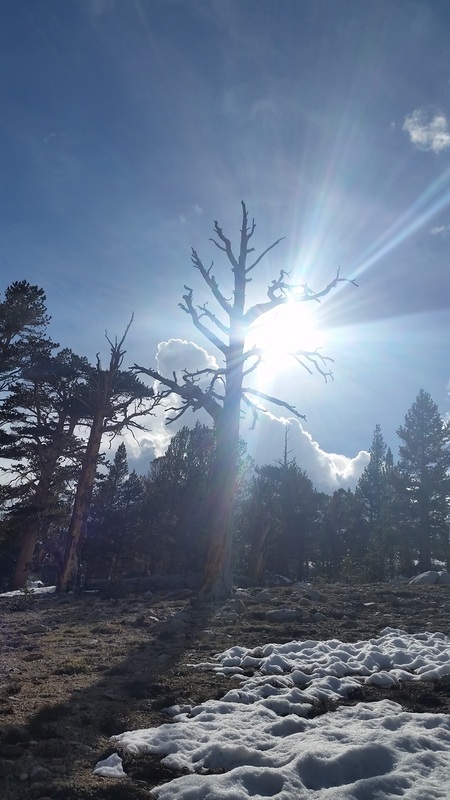 We walked in a spot of sunshine as dark clouds hovered above where we were heading and off to our right. 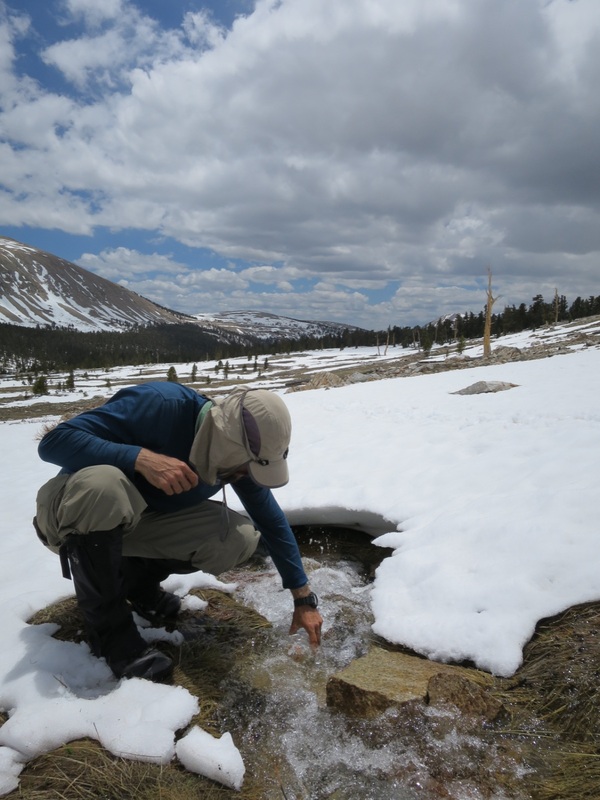 We walked on patches of snow, post holing frequently and consequently bypassing the snowy patches for dirt. Around 1:30pm we decided to call it a day while still amongst trees. 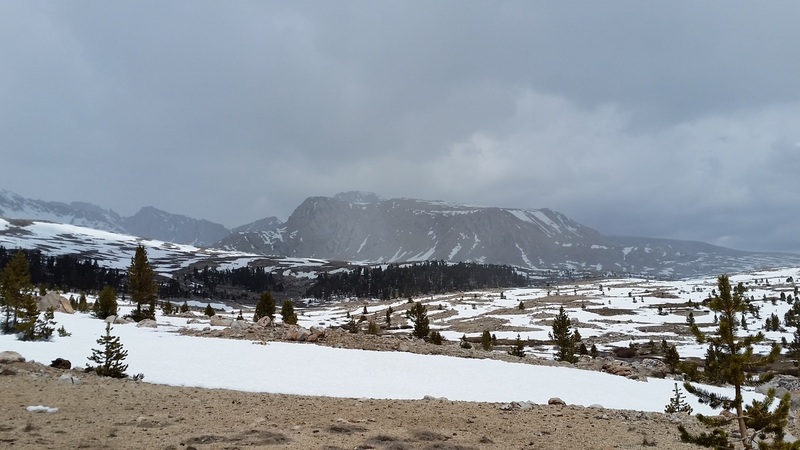 Even though the ominous clouds on top of and around Forester Pass were beginning to part, we didnt know if they would return tonight. 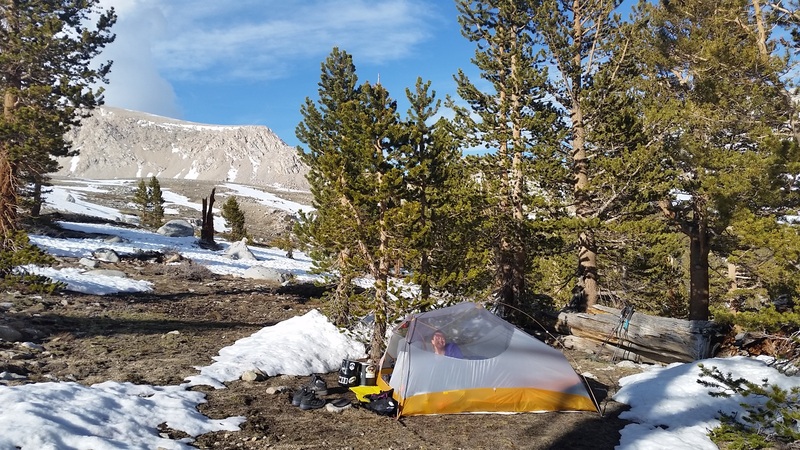 In 2012 Andy got caught in really foul weather when camped around 12,500 ft near the base of Forester Pass. We figured it wasn’t worth the risk with weather in the area. We will simply get up at 3 am tomorrow and be on the trail by 4, making up the 2.9 miles (we didn’t walk today) on sturdier snow. The rest of the afternoon we spent lounging about, going through our photos from the day before, napping (Laurie), stretching (Andy) and eating (both of us). Laurie kept going back and forth about whether we should have kept going. She has trouble with just sitting around. “What should I do?” Asked Laurie after being reassured by Andy for the umpteenth time that we made the right decision to stop early. The temperature quickly dropped as the wind picked up and the sun set. 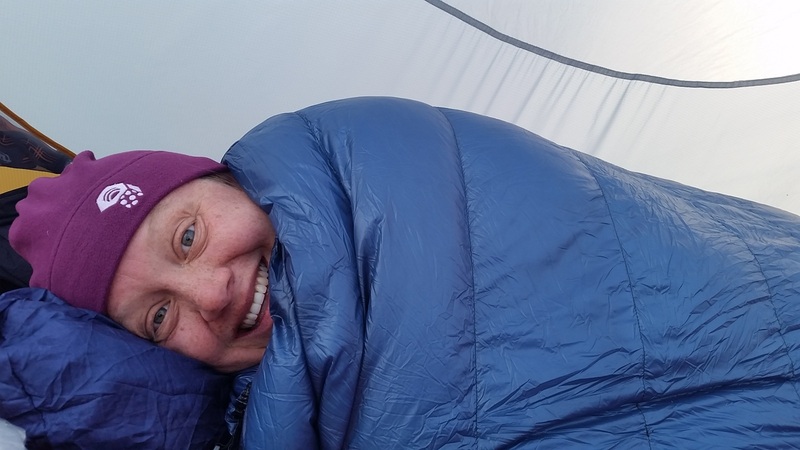 We ate dinner inside the tent in our sleeping bags. Not the smartest idea given we are in bear country but we were careful to clean up all the crumbs! It is 7:45pm and we are all ready for bed. At least stopping early allows us to go to bed early! Tonight we are grateful for waterproof boots and trekking poles. 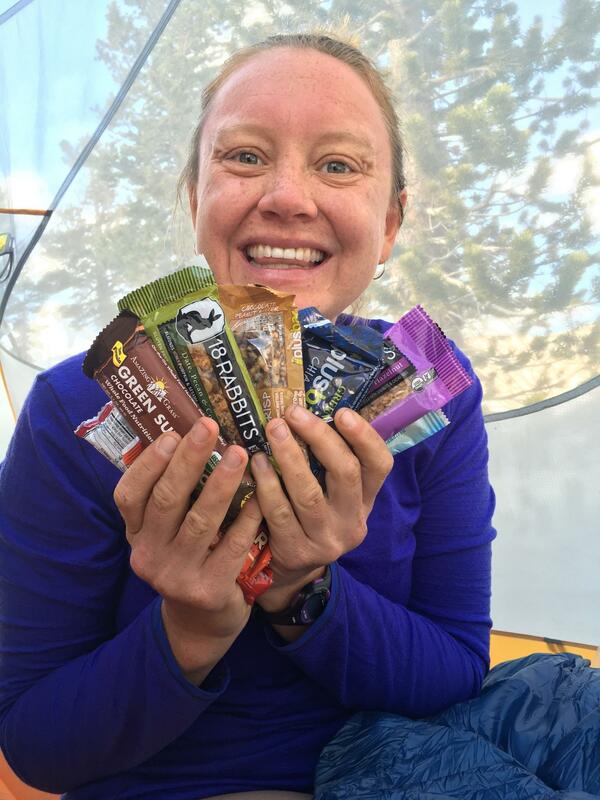 ← Day 55 – Back to where it all began – Mt. Whitney!